In this day and age, you seldom get a locked picture before you start spotting. And conforming your cues can sometimes be a real nightmare. Having a computer program that lets you insert and delete time is a necessity, but simply doing a change note "by the numbers" isn't good enough. You need a program that also lets you make intelligent choices. 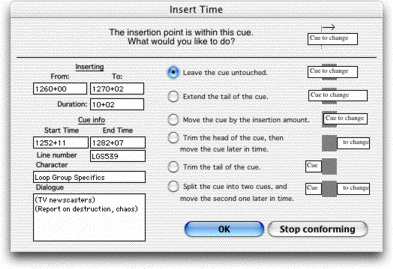 For instance, if you're inserting time into the middle of a cue, you want the option of either extending the tail of the cue by the appropriate amount, or trimming the tail of the cue, or splitting the cue into two cues, or leaving the cue alone, right? ADR Manager gives you complete control over the conforming process, so that your carefully spotted cues remain accurate. What if you've typed a footage in the dialogue field, say, to give some direction to the talent at a specific point within the cue? ADR Manager will recognize the footage and update it accordingly. By the way, the scene continuity will be conformed automatically as you go.